Potatoe, the Common, or Solamum Tuberosum, L. a valuable root, originally a native of America, whence it was introduced into Ireland ; and subsequently into Britain, about the commencement of the 17th century. There are numerous varieties of the potatoe, which are cultivated both for culinary purposes, and for the feeding of cattle. The most remarkable of these are: the Common Kidney ; the Red American Kidney ; the Aylesbury White ; and the Altringham Early White ; which are chiefly reared for the table; as the Ox-noble (for the most part in Nottinghamshire) ; Surinam ; Irish Purple ; Howard or Clustered ; and Red Potatoes, are for fodder. The common mode of planting potatoes is, by setting the small roots entire ; or, by cutting the larger ones to pieces, and reserving one eye or bud to each : it appears, however, that the rind may be employed with equal advantage; as crops have thus been produced, which fully equalled those obtained from seeds, sets, shoots, or by any other method. These plants will fourish in any tolerable soil 5 but they thrive most luxuriantly in light sandy loams, that are neither too moist nor too dry. Such lands ought to be deeply ploughed, two or three times ; and, shortly, before the ground is stirred for the last time in the spring, it will be necessary to spread a considerable quantity of rotten dung on the surface, which should be ploughed early in March, provided the weather be open ; but, if it be frosty, this operation must be delayed till the end of that month, or the beginning of April. After the last ploughing, the ground ought to be levelled the furrows drawn at the distance of three feet apart; and at the depth of about seven or eight inches. In the centre of this furrow are to be set the rind, eyes, cuttings, etc. ; and then covered in with the earth. A short time before the young plants appear, it will be advisable to pass a harrow oyer the whole, in order to eradicate weeds, to break the clods, and to remove every obstacle to their vegetation. Farther, as the potatoes increase, it will be proper to mould, or earth them up twice; a process, by which their growth will be greatly promoted. Mr. Turner's plough is eminently adapted to this purpose ; but, having already described the implement under the article Plough, we refer the reader to p. 407, and foil, of the present volume, where the manner of employing it is concisely stated. Beside the depredations of worms, grubs, and various other insects, to which potatoes are subject in common with other vegetables, there is a disease termed the curl, that peculiarly affects these roots ; and for which ingenious agriculturists have endeavoured to account by various conjectures.—By some it is considered as a species of blight, but it is more generally attributed to one or more of the following causes — \. Frost, either before, or after the sets, Sec. have been planted. 2. The planting of such sets, from large or unripe potatoes. 3. From not placing them at a sufficient depth, or from putting them in exhausted lands. 4. By the first shoots of the sets having been broken off" previously to planting in consequence of which, the seminal plant is incapacitated from sending forth other shoots sufficiently vigorous to expand. 5. To a white grub, that preys upon the roots. 6. To the propagation of shoots, sets,. eyes, etc. constantly from the same variety, and on the same land; so that the" potatoes degenerate, and at length yield very indifferent crops; In the 8th volume of the Trans-actions of the Society for the Encouragement of Arts, etc. we meet with an interesting communication on the curl, by Mr. W. Hollins, who divides the disease into three different stages, viz. 1. The Half Curl, in which the leaves of the plants are somewhat long, and slightly curled : they produce, however, tolerable crops, if the summer be not too dry; otherwise the potatoes will be small and watery. 2. The Full Curl: in this stage the plants seldom exceed the height of six or seven inches; speedily attain to maturity, and decay. The potatoes are, in general, less than a nutmeg ; of a dusky-red colour ; and are extremely unwholesome as an article of food. 3. Corrupted Potatoes, the vegetative power of which is almost destroyed, never appear above the surface of the ground. The seed will be found at Michaelmas in a state, apparently as fresh as when it was first set; a few small potatoes perhaps, growing from the parent root. This accurate observer attributes the curl first, to late setting in rich soil, succeeded by a hot, dry summer ; in consequence of which the flower of ,the plant falls off; the seed is exhausted in feeding the plant; and few potatoes appear. Should moist weather occur in autumn, the plants, after being earthed, will blow a second time, and a plentiful crop of potatoes will be produced. These are, in his Opinion, perfectly wholesome as food; but. being generated from the stalk of the plant after the seed had been exhausted, their vegetative power is defective, and the plants that proceed from them, will necessarily be curled. The second cause of this disease, Mr. Hollins attributes to the forcing of potatoes, by setting them in too rich a soil. His preventive method consists in planting them early, in ridges about one yard apart, having previously spread a little manure in the trench.— They are to be set in a triangular form, five or six inches distant, and covered with soil to an equal depth : thus they will be protected from the heat of the sun, in case the weather be too dry, while they remain sufficiently apart for receiving the full benefit of the air. When the plants have attained the height of six or seven inches, he directs them not to be earthed up, but to be occasionally weeded.— By this simple method, roots will be formed in due season, and grow gradually ; and, as the stalk will decay at the. proper time, the sap will be left in the potatoe, and bhe-come a seed, possessing a perfect power of vegetation ; so that the plants raised from it will be wholly exempt from the curl. There prevails another opinion respecting this disease, namely, that It is contagious ; but such motion has been ably combated in the 2d vol. of Communications to the Board of Agriculture ; where it is observed, that whatever tends to render a crop poor and weakly, is very apt to produce the curl: hence, the disease probably originates entirely, or in a great measure, from the following causes : 1. Land, altogether unfit for potatoes. 2. Imperfect culture. 3. Small roots; or too small a proportion of strong roots. 4. Sets, taken from roots that have sprouted early, and the germs of which have been rubbed off. 5. Too small, as well as too large a quantity of dung. 6. Too deep, or too shallow planting. 7- Every external impediment that may injure new plants. 8. Too stiff ground, or such as has been pressed down too closely on the sets. 9. An unfavourable state of the weather, while the crop is young.—The result of the writer's inquiries briefly is, that, if the curl be not a disease, but merely an incidental debility, it may be prevented by diligent attention to all those circumstances ; which, according to experience, are essential to the prosperous cultivation of potatoes. It is difficult to decide, amid this difference of opinion among practical agriculturists; but, as these roots materially contribute to the comfort of mankind, we have discussed the subject at some length ; and shall now concisely state those remedies which have been successfully adopted. These are, steeping the sets for two hours, in a brine made of Whisters' ashes; changing the seed, raising new kinds from the seed, or apple of the plant; or renewing the game sorts again from the same seed: and, lastly, salt is said to be an excellent preventive against the depredations of the grub. Beside the curl, potatoes are liable to two other disorders, viz. the scab, which consists of excrescences that arise in very dry seasons ; and the canker, which is occasioned by small cavities, that ar in wet weather. These defects have been conjectured to be in some measure the cause of the curl; and they increase, according to the length of time the potatoes remain in the earth, after the roots have attained to maturity. The proper time for digging up potatoes, is in the dry weather of autumn, when the leaves and stems begin to decay. If they are cultivated on a small scale, this work is performed by means of a three-pronged fork, furnished with flat tines: but, when raised in fields, the roots are turned up by a plough, the coulter of which is taken out, to prevent them from being cut. After those, which appear on the surface, are- collected, a pair of drags is passed over the whole in order to separate and expose such as may adhere to the clods. The potatoe is one of the most valuable roots for culinary uses: when boiled, it forms a principal article of food, and serves partly as a substitute for bread. Mixed with wheaten flour, fermented with yeast, and properly baked, it ma a wholesome and nutritious loaf:— the most economical method of preparing these roots We have already stated, vol. i. p. 330. 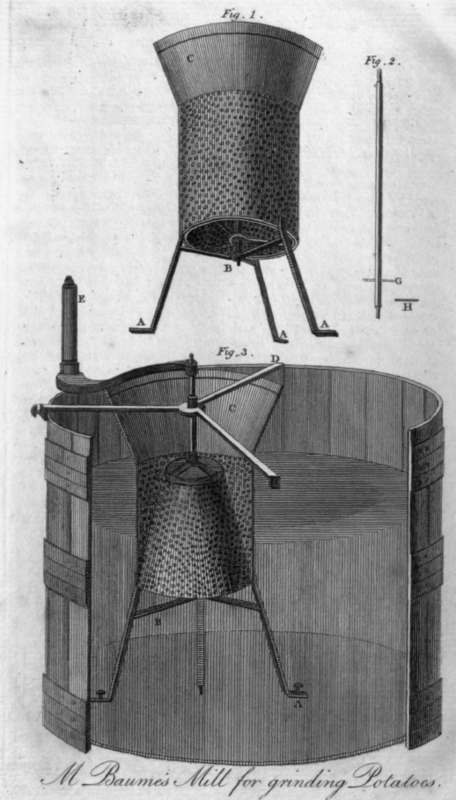 M. Baume's Mill for grinding Potatoes, of which we have given an engraving, from the Memoirs of the Academy of Sciences at Paris. Fig. 1. Represents a grater made in a cylindrical shape, of plate-iron, which is about 7 inches in diameter, and 8 inches in height. The burs, formed by stamping the holes, are on the inside. A, A, A, are three feet, made of flat iron bars, 7 inches in height, for supporting the grater, to which they are strongly rivetted. The bottom of each foot is bent horizontally, and furnished with a hole for the reception of a screw, delineated at A, Fig. 3.—At a little distance from the upper extremity of these feet, is fastened a cross piece, B, (Fig. 1 and 3), which is divided into three blanches, and rivetted to them. This transverse piece not only serves to strengthen and keep such feet steady, but its centre being perforated with a hole, also supports an iron spindle (Fig. 2), the use of which will be presently described. The upper part of this cylindrical grater is furnished with a diverging border of iron, marked With (be letter C, (Fig. 1 and 3), and which is about 10 inches in diameter at the top, and 5 inches high. Farther, within such machine is fixed a second grater of a conical form (see F;g. 3); which is constructed or thick plate-iron, fastened with the broad end at the bottom. The litis of the holes are on the outside : to the upper end of the cone, there Is rivetted a small cross piece of iron, consisting of three branches ; and in the middle pi which a square hole is made tor the reception of the spindle. This part of the cone is likewise strengthened with an iron cap rivetted to the grater and perforated with a square hole, for the admission of the spindle. Fig. 2. Represents such spindle, which is a square iron bar, about 16 inches in length, and somewhat more than half an inch in thickness. Both extremities, which are round, fit into the cross pieces B, (Fig. 1 and 3) and D, (Fig. 3), in the centre of which the spindle turns, and by means of which it is retained in its place. The upper end of such spindle ought farther to be square, in order that a handle (E, Fig. 3), may be affixed to it, which is about nine inches in length, and turns round the conical grater. G, a small hole made through the spindle, in order to receive the pin H, that serves to keep the conical grater at a proper height within its cylindrical counterpart. Fig. 3. Is a bird's-eye view, representing the mill placed within one end of an oval tub, resembling those employed for bathing. D, is the triangular iron cross above-mentioned, which is screwed to the side of the tub; and in the centre there is a round hole, in which the spindle of the mill moves when at work. In this figure, part of the conical vessel is delineated as being cut off; in order that the internal structure of the machine may be more distinctly seen :—to prevent the bottom of the tub from being worn by the screws passing through the feet of the mill, a deal board about an inch in thickness, is placed beneath the latter. In order to employ this machine, its feet must first be secured, as already described, and likewise the top, by means of the cross-piece D, (Fig. 3). The tub is next filled about two-thirds of the whole with water ; and the top of the vessel with potatoes, that have previously been washed and sliced. The handle E, (Fiq. 3), is then turned round, and the roots, after being ground between the two graters, are dis -charged gradually at the lower extremity ; their egress being facilitated by the agitation produced in the water, in consequence of the operation of the mill. When all the potatoes are, ground, the pulp must be mixed up in a tub with a large quantity of pure water. A second vessel ought farther to be provided, on the brim of which two wooden rails should be fixed for the support of a hair-sieve: the liquid pulp is next to be poured through it; the flour, or starch, passing together with the fluid, and at length subsiding. In the course of five or six hours, the liquor may be poured off, and fresh water successively added (the pulp being occasionally stirred), till the fluid is-discharged perfectly transparent.— When the flour is sufficiently washed, it must be taken out, placed on wicker-frames, and dried ; care being taken to shelter it from the dust: as soon as all moisture is evaporated, it should be passed through a fine sieve, and preserved in glass vessels, covered with paper. Such is the object of M. Baume's useful contrivance, which deserves general attention ; for, if wheat should at any future time again rise to an exorbitant price, potatoes may thus be readily converted into wholesome and nutritious flour. It is said, will support six horses per day with such effect, that the animals will be enabled to perform constant labour, without the allowance of either hay or oats. Farther, bullocks fatten more speedily on potatoes, than on cabbages or turnips, especially if a double portion of chopped hay or straw be mixed with the former. Cows also thrive well on these roots ; so that with one bushel per day, together with a little hay, they will yield as large a quantity of sweet milk, or butter, as they usually produce, when fed on the finest grasses. Potatoes are likewise serviceable in fattening sheep, and especially hogs ; but, if the latter be designed for bacon or hams, it will be advisable to mix gradually four bushels of ground pease, with an equal quantity of the boiled roots ; which portion will, it is affirmed, fatten an animal of twelve stone.— In a boiled state, they may also be given to poultry with similar effect. Formerly, a kind of brandy was distilled from these roots; but the Legislature has wisely prohibited such practices.—Besides, a fine size may be prepared from potatoes, which will answer all the purposes of that in common use, particularly for whitening ceilings and walls. With this intention, any quantity of newly-made po-tatoe-starch should be boiled into a paste ; a sufficient portion of which ought to be mixed with the whiting, after the latter has been diluted with water. The coat thus prepared is much clearer; retains its whiteness longer, and is less liable to crack or scale, than such as is mixed with animal glue.— There is another economical way of employing the water expressed from potatoes in the processes of making starch or size. This liquor is useful for washing linen, whether plain or coloured, silk hand-kerchiefs, stockings, etc. without the aid of any ley or soap : it is said to improve rather than to diminish the tint, while it restores their original brightness, and imparts a degree of stiffness to silk stuffs, which cannot be obtained by the common method of cleaning them. It deserves, however, to be remarked, that no discoloured or otherwise damaged roots must be used for this purpose.—Bakers in Germany, farther, convert the pulp of potatoes into yeast, by adding a small proportion (about the 8th or 10th part) of the latter, together with two drams of calcined and pulverized crab's-claws or oyster-shells, and a similar quantity of burnt hartshorn, to every pailful of the preparation. This compound is asserted to increase the bulk of the paste, and consequently of the bread ; but double the measure of it is required to serve as a complete substitute for barm. — See also Cheese, vol. i. p. 501. F placed for six or eight hours in a colander to drain, when they ought" to be boiled in good vinegar, with the addition of some spice, till they acquire a certain degree of transparency, without becoming too soft. Thus prepared, they will afford a more palatable and less hurtful pickle than either olives or cucumbers. Potatoes being of such extensive utility, various expedients have been contrived, with a view to preserve them. The most common method is, that of piling them up after they have become dry, in heaps resembling the roof of a barn; covering them closely with straw, in such a manner as to meet in a point at the top ; and then slightly spreading them over with mould, which is beaten down with a spade. Some husbandmen make holts in the sides and top of the earth, in order that the air, arising from the natural heat of the roots, may evaporate and, as soon as the steam ceases, the cavities are filled up, to prevent the effects of frost or rain. Another mode consists in depositing them in pits, and covering them with dry straw, or with the haulm of the roots ; by which management, if their surface be perfectly dry at the time they are put in, potatoes may long be preserved in a sound state. A continental writer of doubtful authority informs us, that such roots may be easily preserved from the effects of the severest frost, by placing a vessel filled with cold water immediately over them: the fluid should be in proportion to the quantity of the vegetables ; and, if frozen, it ought to be removed every morning and evening ; When a new supply must be instantly procured.—The same author observes, that frost-bitten potatoes may be rendered equally, nay, more useful than those in a fresh state. This paradoxical proposition he supports by the following directions :-Se-lect all the roots thus injured ; place them in a dry and warm place till the frost be expelled ; then remove the-peels, cut them in slices., and place them on wicker frames thel they are perfectly dry. Thus they acquire a dark hue, lose three-fourths of their bulk, and retain only the inspissated sap, which becomes very bard and incorruptible, so that it may advantageouly be used on long voyages. When reduced to powder, and boiled with broth, milk, or water, with the addition of vinegar and a few aromatic herbs, those frozen fruits are said to afford a very palatable and nutritive food. Comforts, etc. of the Poor, we shall extract an interesting paper on the preservation of potatoes, by Mr. MIillington.—According to his statement, three pounds of potatoes were peeled, rasped, and put in a coarse cloth between two boards, in a napkin-press, till they were compressed into a very thin cake, that was placed on a shelf to dry. The roots yielded, on expression, about one quart of juice; which, being mixed with an equal quantity of cold water, deposited in the course of an hour, upwards of one dram of white flour or starch, in every respect fit for making line pastry.—Mr. M. presented in 1799, to the above-mentioned Society, a Cake, which had been thus prepared in the year 1797. in bulk, it occupied only one-sixth part of the original roots . and lost about two-thirds in weight by the process but he observes, that such.cake, when dressed by steam, or otherwise, will afford nearly the same quantity and weight, as three pounds and a half' of potatoes, properly boiled.—Some roots, that had been thoroughly frozen, have been managed in a similar manner ; and the cake was perfectly sweet; whereas others of the same parcel, that were left impressed, in a few days became rotten. Mr. Millington's second method of preserving these roots, is as follows : Five pounds of potatoes were properly cleaned and pounded in a mortar, without being previously peeled; and then pressed in a small wine-press, into a thick cake; the whole being completed in the manner above described. This cake also was sweet and wholesome, but did not possess the clear whiteness of the former ; nor does it appear that such as were prepared according to the last process, will remain sweet for the same length of time as those consisting of peeled potatoes.—At all events, this contrivance deserves to be farther pursued and improved ; for, independently of the immediate advantages that will result from supplying mariners with vegetables, it is an object of the greatest importance, when considered as a mean of preserving so useful, though perishable, an article for years ; and of laying up a store in plentiful seasons, against the time of scarcity. Another mode of keeping potatoes, was lately and successfully tried, by the patriotic Bath and West of England Society; and which certainly is less complex than that before described. It consists simply in slicing potatoes, without taking off the rind or skin, and afterwards drying them in an oven or kiln. The roots thus prepared will remain sweet for almost any length of time : the Society sent some to Jamaica in a barrel; which had been four years from Britain, and, on their return, were found not to be in the least degree affected.